I am certain that I will never be accused of failing to make an honest comment when needed. As an example, some years ago a friend owned an Uzi carbine and thought it was the best thing in the world for home defense. I disagreed completely. The trigger action was too heavy to allow good hits, and it was difficult to get hits with on the combat range. The Kel-Tec Sub 2000 is a neat package and potentially a life saver. The real thing—short barrel, full-auto Uzi—is another matter. So is the Thompson SMG. They served a real purpose in house-to-house fighting. 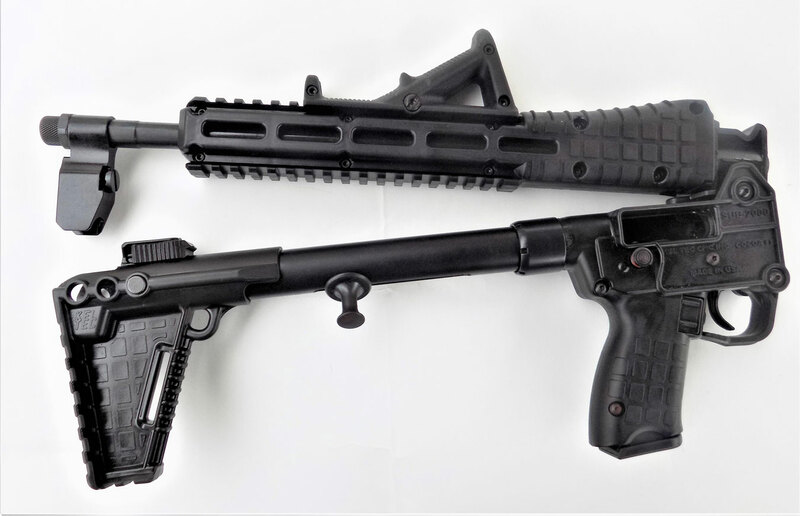 The semi-auto versions with 16-inch barrels are quite inferior to the shotgun for home defense and particularly to the AR-15 carbine. The purpose-designed 9mm carbines such as the Beretta Storm and even the High Point carbine are better choices. Easy to use well and with decent triggers, these firearms are not collectible, but they serve a real purpose. Many shooters find the handgun a difficult proposition to master. Considerable time and effort, as well as expense, is involved. In the end, you’ll have a firearm that isn’t as accurate or powerful as a shotgun or rifle. The answer for many is a pistol caliber carbine. Like Rand Paul’s wife, many of us like to keep a firearm beside the bed, and the 9mm carbine is an excellent choice. 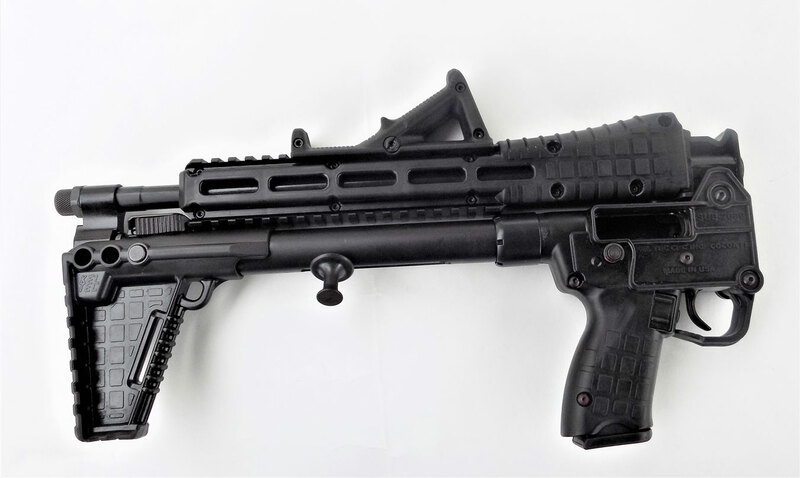 The Kel-Tec Sub 2000 dispenses with all of the problems of the semi-automatic SMG and is a neat trick compared to the best of the competing 9mm carbines. The SUB 2000 isn’t heavy, it has a usable trigger— perhaps I should put more emphasis on it isn’t heavy—it is a feathery-light firearm that handles quickly. Compatibility with Glock magazines is a big plus for this 9mm carbine. You have to aim it carefully. You cannot use the figure eight tactic or the “shoot through” that were developed for fully automatic shoulder fired firearms. But it handles quickly and has a much higher hit probability than a handgun. On a purely personal defense basis, the 9mm carbine is more effective than any handgun based on handling and accuracy potential. But there is more to the equation. The 16-inch barrel carbine also develops greater velocity with a given load than a pistol. The powder burns more completely and the long barrel results in nearly complete combustion. I did not detect muzzle flash (unburned powder) with any load tested in evaluating the Kel-Tec Sub 2000. You must realize this is a niche firearm. The Kel-Tec Sub 2000 is a great carbine for carry in the vehicle for an emergency and practically an ideal home defense firearm. It isn’t as versatile as an AR-15 .223 rifle. The Kel-Tec is less expensive than an AR, requires less maintenance, and exhibits less much less muzzle flash and blast. The 9mm carbine isn’t well suited to long range shooting or taking medium game, and it certainly isn’t a varmint rifle. But what it can do, it does very well. I do not abuse a firearm but the SUB 2000 will take hard use and thrive. A pebble grained grip offers excellent adhesion and abrasion. The SUB 2000 is hinged in front of the chamber and pivots to fold to a neat 16 inches. (Never keep any long gun chamber loaded in the home or vehicle. It doesn’t take a second to make it ready, so there is simply not a need.) 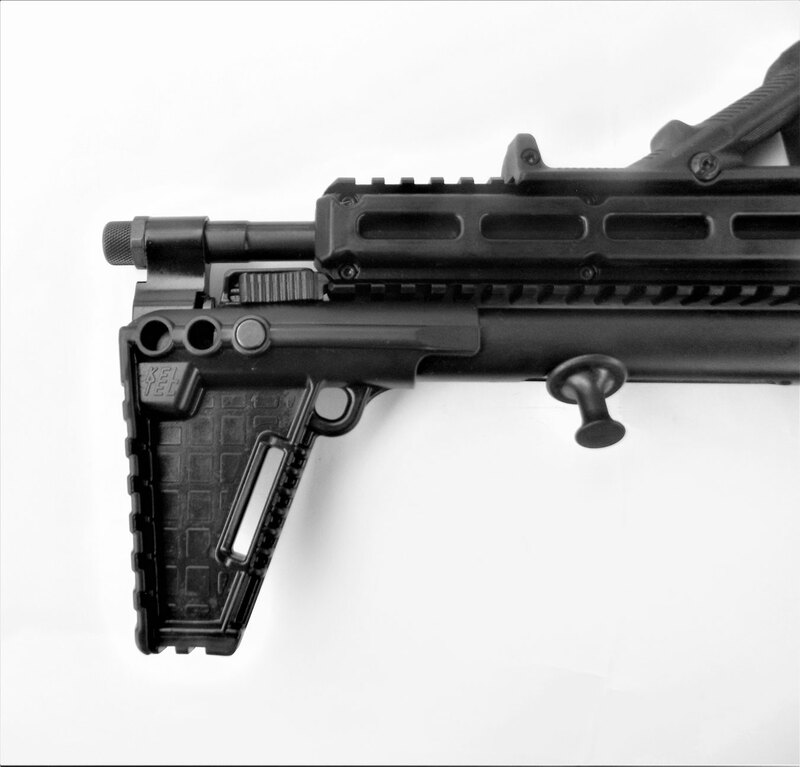 Unfolded, the Kel-Tec Sub 2000 is at 30 inches with just over 16 inches of 9mm barrel. There is a rail for mounting red dot or laser sights, or even an inexpensive scope if desired. You may mount a red dot up top and a combat light in the lower rail. Someone mounted a low profile handgrip on the lower rail before I owned the Sub 2000 illustrated. The SUB 2000 carbine is a straight blowback action like a .22; it isn’t gas operated. Common sense would tell you that the heaviest loads would batter the rifle, but the Kel-Tec SUB 200 never stuttered with +P loads. The rifle uses Glock magazines, but there are versions for other magazines. This makes for easy availability of magazines whether you own a Glock 17 9mm or not. The SUB 2000 folds easily by releasing the trigger guard and folding the rifle into the storage position. Be certain the piece isn’t loaded! When the rifle is folded, the front sight is snapped into a catch on the SUB 2000 stock. This catch must be released to return the carbine back to its firing position. A hinged trigger guard is pulled to fold the carbine. The polymer frame and grip are durable, and the grip is comfortable in the firing mode. 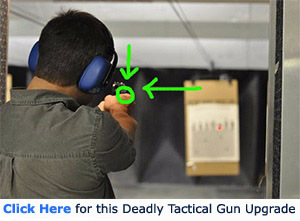 The trigger action is spongy and would be difficult to control in a handgun, but presents far less difficulty in a rifle with its leverage. The magazine release isn’t difficult to use. The Kel-Tec SUB 2000 features a peep rear sight and bold protected front post. It takes practice to be able to quickly focus on the sight and align it. Perhaps the rear aperture could be a little wider. However, the sights are very precise when lined up. The sights are regulated properly for 115- to 124-grain ammunition. The front sight allows windage and elevation adjustment. The rifle is supplied with a Magpul magazine but accepts standard Glock 17 or 33-round magazines. I fired the Kel-Tec SUB 2000 for handling, speed, accuracy, and reliability. I have fired over 500 cartridges during the past week without a single failure to feed, chamber, fire, or eject. A catch on the stock locks the carbine in the folded position. The carbine has not been cleaned or lubricated. I began with the SIG Sauer 115-grain FMJ ammunition and also used 124- and 147-grain SIG ammo. Personal defense ammunition included the Hornady 115-grain XTP and Hornady 147-grain XTP. Function was good. At 20 yards, I fired a magazine full of the 124-grain SIG load into a group that measured less than four inches. This group was fired as quickly as I could press the trigger after regaining the sights from recoil. In slow fire, firing from a braced position, I was able to fire several 5-shot groups of less than two inches. While there are handguns this accurate, the Kel-Tec Sub 2000 9mm carbine is much easier to fire with this degree of accuracy. Speed to a good hit and follow-up shots were excellent. When the rifle is at home ready or in the vehicle, the SUB 2000 should be kept chamber empty. There is a cross bolt safety that isn’t difficult to operate quickly. When action is likely, the bolt is racked and the rifle made ready. A few drills in quickly accessing the piece and racking the bolt went smoothly. While the pistol folds up neatly for storage, you have to decide how much time is spent in making the carbine ready if it is kept at the ready folded. 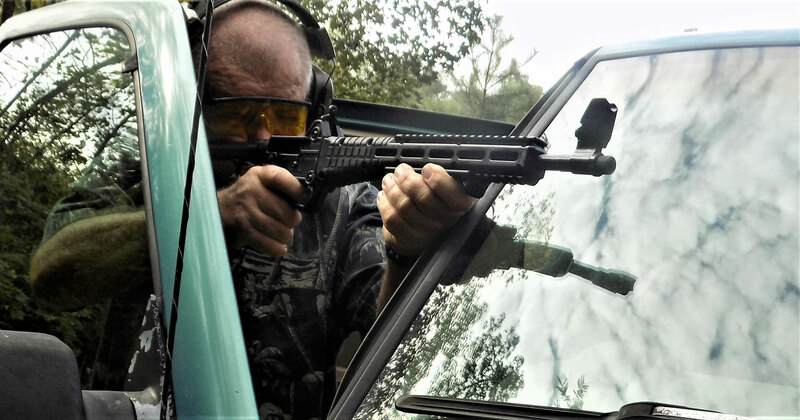 Firing from a braced vehicle firing position the Kel-Tec featured good accuracy and authoritative power. The Kel-Tec Sub 2000 is a fairly simple firearm to operate, but the owner must consider the specific role the firearm will be placed in. For home defense, for those who have difficulty with the handgun or shotgun, the Kel-Tec Sub 2000 carbine is an outstanding choice. For area defense on larger properties, the carbine is easily stowed and carried. 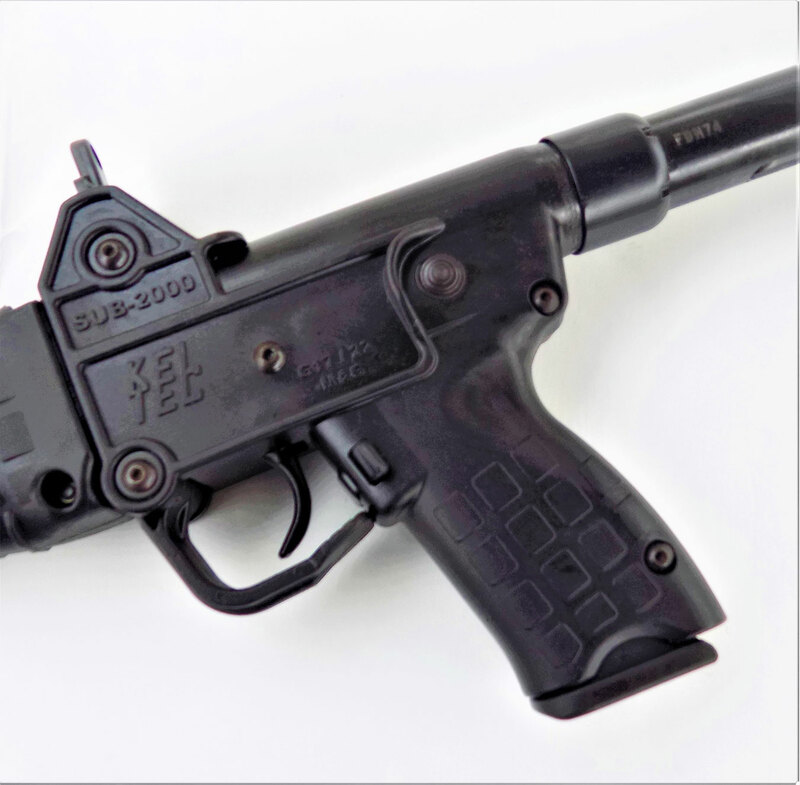 The Kel-Tec Sub 2000 is one of the neatest tricks on the market. I have tested pistol caliber carbines in the past, and I am familiar with the advantages of a longer barrel when using standard pistol ammunition. However, the performance of the loads tested was exceptional. I tested the Hornady American Gunner 124-grain XTP +P first. A 5-shot group at 20 yards measured two inches. Fired in a Glock 17 pistol on hand, the Hornady load averaged 1,180 fps. In the Kel-Tec Sub 2000 velocity was 1,409 fps. This is excellent velocity putting the Kel-Tec Sub 2000 in a different category than any 9mm pistol. Moving to the SIG Sauer Elite 124-grain V Crown JHP velocity in the Glock was 1,201 fps. When fired in the Kel-Tec carbine I fired a two-inch group at 20 yards. Velocity was a strong 1,386 fps. Yet, this type of velocity comes without the penalty of high recoil and excess muzzle flash. The 9mm carbine isn’t a .223 rifle by any means, but it is clearly an effective home defense firearm. Are you a fan of pistol caliber carbines? Would you rather have a Kel-Tec Sub 2000 or Kel-Tec PMR-30? Share your answers in the comment section. As I understand, Kel-Tec makes this same weapon, compatible with several different handgun manufacturer clips. I would LOVE to see this EXACT same weapon, but chambered for the 10MM, with 2 specific magazine variations: Glock magazines, and the new XD-M magazines. For home defense, the 9MM is acceptable. But, as a pack rifle, the 9MM just would not cut it against larger animals. This weapon, chambered for the 10MM, would be excellent for both home defense, and emergency wilderness protection. To be honest, I’ve held the Glock in 10MM, and I just don’t like the feel of the Glock in my hand. But, since many people do like the Glock, that’s a viable variant. Since I will have the XD-M in 10MM, it would be great to have a pack rifle that could use the XD-M magazines interchangeably. I have a 9mm rifle an I and my grandson enjoy it. I will get me one of these. Putting rounds down range is what it is all about. Also, I would like for smeone to put the 45 cal into this style weapon.